Show all social activities of your store in one livestream. Your customers will be able to track all what other site users are buying, socially sharing (requires Faves Magento Extension) and interested in. Shows the Live stream of products that clients purchased or liked. Your clients can comment and share products directly on the live feed page. AJAX event autoload adds new products to the livestream without page reload. Magento Live Feed is used for providing users with frequently updated content. Module aggregates all client-related activities in your internet store on one single page. Actions include - buying a product, adding a product to favorites and liking a product using different social networks (requires additional Magento extension "Plumrocket Faves"). 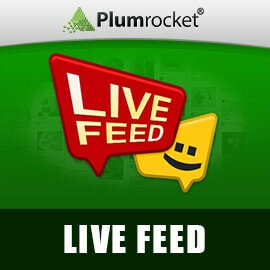 If you are still hesitating on whether to order Live Feed Magento Extension from Plumrocket, look at the following figures: the latest research shows that up to 15 percent of all visits to the Customer's Activity Stream end in a purchase. People like to be sure their choice is right when buying something. Live Feed Magento Extension can give them the opportunity to see what is in demand and feel free to add items to their carts. NEW! Added guest user activity to the live feed. From now on, both registered and guest user activities are displayed. Everything is on one place. I also like tracking users' activity on my website. A very easy-to-use extension. There is nothing superfluous, only the needed options. A must have extension for engaging with your customers. With great support and easy configuration. I want to buy it because it is very Useful feature for my store. This is a must have extension for engaging with your customers. They get to see each action that's happening on your service, which is use. I recommend this extension for all services using Magento. PlumRocket got my attention first time with this extension particularly. I got more impressed by their kindness and support to assist me along the way with all custom development. I have not encountered any issue. Highly recommended. Appreciate Plumrocket for this piece and support! Useful feature for my store, this social commerce add-on really boosted up my revenue. They also have great support. Thanks! Purchased this to have a summary of main interactions of customers (sale, faves, likes) all in one page. I appreciated also possibility to have guest interaction on it: definetly a great extension with excellent support. This module is worth buying if you take into account how your website becomes more live and people actually see what others, even guest visitors are doing. Was a good choice for me. Added guest user activity to the live feed. From now on, both registered and guest user activities are displayed. After the installation the extension is disabled by default which allows the site owner to enable extension when necessary and not when it is installed.